The NEC 1100021 is an 8 Port Analog Station Card that connects 8 analog extensions. 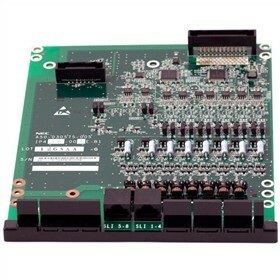 The card provides interface for eight analog stations and is equipped with two 8-conductor interface jacks. It installs in the expansion slot of main KSU and expansion KSU. The NEC 1100021 has many exciting features for users of all types. You can extend the lifetime of your NEC 1100021 with the purchase of a FactoryOutletStore Factory Protection Plan. The NEC 1100021 is sold as a Brand New Unopened Item.